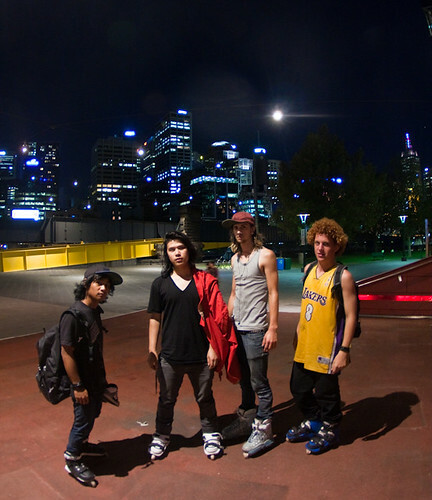 For the past 3 weeks, Tuesday nights in Melbourne have seen a decent gathering of rollers the Riverslide skatepark. If you’re up for some chill sessions you should come down and check it out. During this time we’ve also made some new international friends by the name of Dave (USA) and Zack (Europe) – So shout outs to those guys. Last night a few of us went for a look down Southbank by the Yarra river, Unfortunately I didn’t have my sync cables fso was relying on the SB-26’s optical slave function..
Here’s a few simple snaps I ran off while we were there.